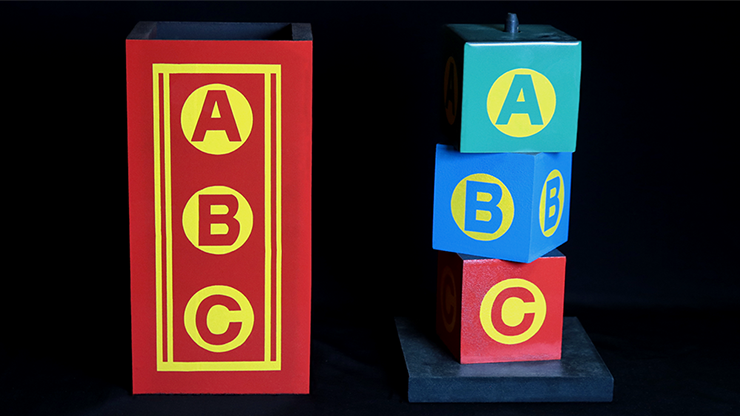 Today, when you order "ABC Blocks by Daytona Magic", you'll instantly be emailed a Penguin Magic gift certificate. You can spend it on anything you like at Penguin, just like cash. Just complete your order as normal, and within seconds you'll get an email with your gift certificate. Here's a great effect where an object vanishes and reappears somewhere else! Three solid wooden blocks are shown to be on a wooden dowel. One at a time, each is removed from the dowel and placed in a top hat or other container for a few moments. They are then returned to the dowel and covered with a tube. Upon removal of the tube, which is shown to be empty, one block has now magically vanished! It is later found back in the top hat. This effect generates lots of applause! I would have easily have given this 4 stars if it had a nicer paint job and was sanded properly. I received this all neatly wrapped in paper and bubble wrap. Couldn't wait to open it..but when I opened it I was surprised by the finish as it was a bit of a rough job. I performed this to my family at a distance, they were suitably amazed but I did keep the blocks moving. Weather I got a bad batch I'm not sure BUT THANKFULLY Penguin of course was there to help! Very happy with their after sales service. I also deducted a star because the gimmick was a little on the big size and a bit noisy but as another magician pointed out..so long as you twist the blocks around, you can't really pick the size difference and with a bit of music you can deal with the noise issue or alternatively I used my finger to catch the gimmick so it doesn't clunk.